Unfair advantage at science fair competitions? Andrew and I planning his experiment. I found this photo in an old shoebox. This was in the early days of my career and my boss had “volunteered” me to help a junior high school student with his science fair project. It’s been a long, long time, but I think his name was Andrew. His mom took the photos in this post as “proof” that he worked on the project. And if I recall his project won at the local science fair competition and he went to regionals with it. I don’t remember how he placed there. Even after 20 years, I remember that his project looked at how a chemical called salicylic acid (which has analgesic and anti-inflammatory properties and is used in acne medications, etc.) effects the cells that line the blood vessels. These cells are called “endothelial cells” and my lab worked with them quite a bit. So, I taught Andrew how to add the chemical to the cells, how to prepare the cells for flow cytometry, and how to run those cells on the flow cytometer. I remember that none of the latex gloves we had in the lab fit his small hands — it was like he was wearing floppy socks on his fingers. I’m not sure how he managed, but he made do. Andrew running his samples on the flow cytometer, with some assistance from me. 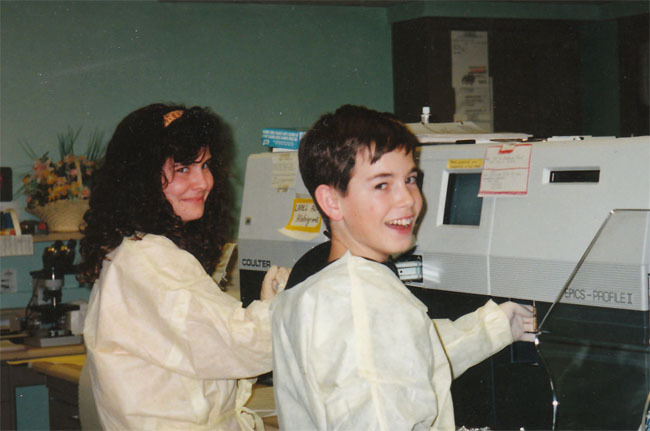 Here this kid is doing an experiment in a bonafide university lab, with lots of help from me and my boss. Did he think of this project himself? No. Did he design the experiments himself? No. Did he perform the experiments himself? Not exactly. I was hovering, ready to swoop in to help at a moment’s notice. I felt in a way it was cheating — he had an unfair advantage over other participants who designed and performed their own experiments in a home “laboratory” (i.e. a kitchen or garage). Sure we were building and nurturing his interest in science. That’s always a good thing in my book. I’m just glad I’ve never been a science fair judge because I’m not sure I could be impartial to the kid who clearly did his project all on his own with no help from a mentor. The project that isn’t so fancy-shmancy but shows the promise of a budding scientist. The underdog. Nowadays, it seems pretty commonplace for serious science fair participants to be mentored by a research scientist. Just look at this year’s winners of the Intel Science Competition. The grand prize winner looked at molecular mechanisms that might slow cancer cell growth — he clearly didn’t do this research in his garage. The same could be said about the third place winner who isolated and mapped a gene. The science competition allows students to work with a teacher, an academic scientist, or an industrial professional. While I admire the science the students present, the cynic in me can’t help but wonder how much of the idea and designing the student actually did on the project and how much the mentor did. Is this practice “fair” to those students who have the interest and drive to do this level of research but don’t have the access to such facilities? Is is okay for kids to do their science fair projects in a research lab? Should the science fair competition organizers limit the amount of outside help a student receives? While I struggle with these questions, I will stop and wonder how Andrew turned out — is he a scientist? Did this experience influence that choice? I have not idea, but I certainly hope it did.